The Captain Proton Mod is a single-player modification for Raven's Star Trek Voyager Elite Force and the Elite Force Expansion Pack. It is based on the metafictional holonovel "The Adventures of Captain Proton" that was featured on various episodes of Star Trek Voyager, including "Night", "Thirty Days", "Bride of Chaotica", and "Shattered". The mod assumes that after Voyager returned to Earth, Tom Paris wrote various Captain Proton holonovels which were published by Broht & Forrester, the same company which published the EMH's opus "Photons Be Free" in the episode "Author, Author". 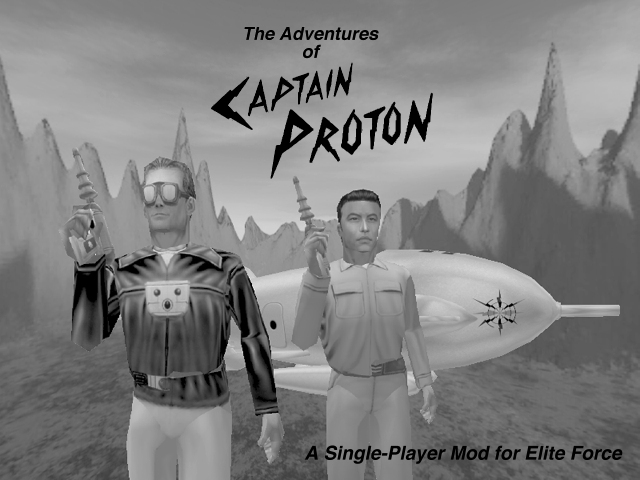 The Captain Proton Mod includes several episodes that span multiple maps, each of them a separate chapter in the Captain Proton saga. Familiar characters seen on Star Trek Voyager appear, such as Dr. Chaotica, Queen Arachnia, Buster Kincaid, Constance Goodheart, Satan's Robot, Lonzak, and the President of Earth. There are many new characters as well, some friendly, some not so friendly. And there are lots of new models too, including rocket ships and weapons. Among the new weapons are the ray gun brandished by Lonzak and Chaotica's guards in "Bride of Chaotica", as well as a more accurate Proton gun than the one included in the Expansion Pack. The full mod has been released as of 12/01/10 and includes five episodes plus a bonus role-playing mini-episode. Additional episodes will be released later on from time to time as add-ons. The Captain Proton Mod has been released and is now available for download. separate zip files, and these can be downloaded from the links below. Below is the current line-up of episodes for inclusion in the mod. Click on the thumbnails for screenshots and more information. Star Trek™ and related names are registered trademarks of Paramount Pictures, Inc.